At least 21 people have been killed by a car bomb in northern Iraq. About 70 people were also injured when the bomb exploded in a vegetable market in Tal Afar, 420km (260 miles) north-west of Baghdad. The town, near Mosul, is in a region where al-Qaeda in Iraq is said to have regrouped since being forced from Baghdad by a US and Iraqi offensive. The vehicle was parked when it exploded by the market, which was crowded with shoppers on the Muslim day of rest. 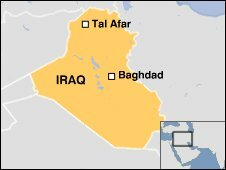 In March 2006, Tal Afar was hailed as a model Iraqi town by US President George W Bush, but almost exactly a year later it was the target of one of the deadliest attacks in Iraq's insurgency, when more than 150 people were killed in a truck bombing. In recent months there have been military operations in the area, says the BBC's Crispin Thorold in Baghdad. But this attack demonstrates once again that Sunni Muslim insurgents still have the ability to bring death to Iraq's streets, our correspondent adds.